Recently I spent some time in St. Albans, Vermont, a town up near the Canadian border. There you will find a small bookstore called The Eloquent Page, which has an entire bookcase full of Godeys, Petersons, and the like, and two or three more with books on fashion history written in the 20th and 21st centuries. Go there if you have the opportunity! 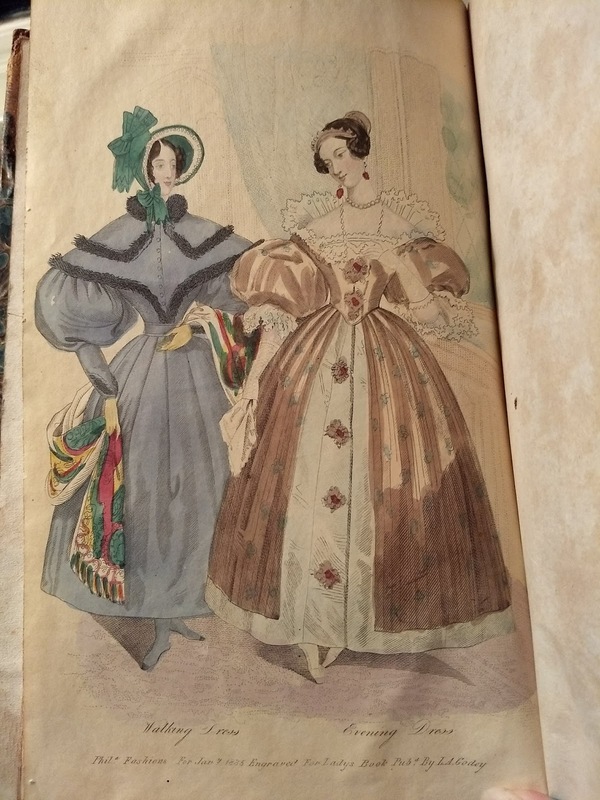 I purchased the 1835 Godey's Lady's Book and the 1842 Ladies' Cabinet. I'll be sharing the illustrations and descriptions from each! Godey's unfortunately does not appear to have run a fashion section in every issue, but for those that don't have plates I'll try to share something else good from the month. Coat Dress. -- Stone coloured silk. The capes trimmed with fur or silk, with buttons in front. Cashmere shawl with gay border. Green velvet bonnet, trimmed with gauze riband, or blond lace. In some instances the 'Bird of Paradise' is added to the trimming. Gaiters the same colour as coat. Evening Dress. -- The under dress is pou de soie, the colour is white, slightly tinged with rose. The corsage is square, rises rather high in front, and is edged with narrow blonde de Cambray. The robe, a little shorter than the under dress, is composed of taffetas de Siam, the ground is a rich shade of golden brown, with a detached pattern delicately traced in green. Corsage à l'Elizabeth made tight to the shape, pointed in front; it is cut of the same height behind as the under dress, but much lower before. The trimming of the bust is blonde de Cambray set on narrow and almost plain on the bosom, but at its full width behind, forming a ruff in a lighter style than usual. A row of enamelled gold ornaments is placed perpendicularly on the corsage, and down the front of the under dress. The robe opens en tablier on each side. Short full sleeves, with manchettes corresponding with the lace on the bust. The hind hair is dressed very low, with front platted on each side, and the ends brought under a gold enamelled comb at the back of the head. The tiara, ear-rings, and neck-chain correspond. Necklace of large pearls. White lace gloves. To me, this evening dress description is really interesting, because I would have assumed from looking at the plate that this was a single gown, or at least a gown open over a petticoat; I would also have assumed that the open front of the skirt had a wide white border, instead of being several inches shorter than the underdress. It's also fun to see that the bodice is named for Queen Elizabeth I when it's really based on Stuart-era styles! Hi there, thanks for the extra descriptive (translation!?) of the original -- I too chuckled at the historic reference to QE I, but I guess folks in 1830 were happier to think of Good Queen Bess than any of the possibly French-leaning Stuart clan? When I really looked at the illustrations, I realized, as I'm no painter, that they were water colors. Pretty expert attempt to my eye to try to render a patterned silk, and the fur trim! These are invaluable. Did you squeal loudly, up there in St. Albans? ?